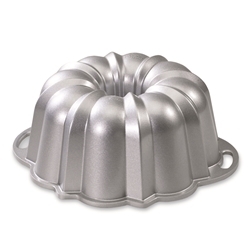 The original Bundt design accommodates 10- to 15-cup recipes and mixes. Its a staple for every kitchen! Handles make lifting and unmolding a breeze. 4. Mixes and recipes may vary. Fill the pan no more than 34 full to avoid overflow.